I used to be obsessed with life hacks. So much so, my mom even bought me a book full of them. I loved learning every possible tip and trick to “outsmart” life and find easier ways to do things. Now, I’ve compiled my own little list of easy hacks you can use to make today a little bit better, and a little bit happier. It’s the beginning of another school year, which means back-to-college or high school, back-to getting sucked into routines, and back-to (an often-overwhelming amount of) responsibilities. A lot of that stuff, like calculus homework and 10 page essays, I can’t make any happier. Neither of us can control the number of hours in a day or the amount of work we get assigned, but both of us can control the way we deal with things, and the way we let these stressful things effect our mood. I’m a perfectionist and a doer. I like to do everything, and I like to do everything exactly right. At the beginning of a new semester, the peak time for activity, this tendency doesn’t get me far, when I don’t have time to do-all-the-things-perfectly and still be in a good mood when my head finally hits my pillow at night. 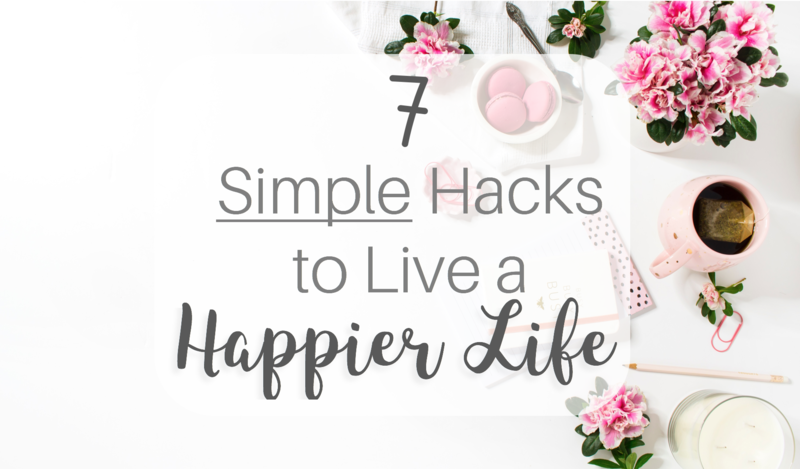 So, I’ve compiled a list of some super easy “life hacks” you and I can both use to do-all-the-things, and be a little happier doing them. Happy Life Hack #1: Wake up earlier. (This one’s even easier if you also go to bed earlier, but hey, baby steps…) I know, this doesn’t sound particularly easy, but hear me out. Determining whether you’re a morning person or a night person is a big part of this. Since starting college, I’ve figured out that I’m 100% morning person, which means I’m (usually) awake and ready-for-the-day as soon as my first alarm goes off. But that also means I’m happier when I’ve had enough time to make my bed, get ready, eat a good breakfast, and prepare myself for the day. I can’t do all that in 15 minutes. When you’re not rushing around in the morning with one shoe on and a bagel in your mouth, trying to find your keys, backpack, and last night’s homework, you’re automatically setting yourself up for a better day. Learning how much time you need in the morning to properly prepare for the oncoming day will set you up for success from the minute your alarm goes off. Happy Life Hack #2: Find your little things. One of my first posts was all about some of my favorite little things. I’m sure you’ve heard me say it before, but I’m a supporter of celebrating the good things in life, big and small. “Finding your little things” means figuring out which little tasks have the biggest payouts for you, and what simple things bring you the most joy. Personally, I feel much more put together as a human when my laundry is done and folded, my nails are painted (pink, probably), and my bed is clean / room is tidy. I also like to use the “2-10” minute rule for prioritizing tasks. If it takes 2 minutes or less (like putting away shoes, or going through the stack of mail), do it now. Make a list of things that take 10 minutes or more, and get them done before tomorrow. In addition, learn to appreciate the simple things in life we miss because we’re too busy moving on to the next thing… Take a minute to “stop and smell the roses”, or at least stop and snap a pic of them! The health benefits of this one are I won’t bore you with reasons, but I promise that simply drinking more water everyday will improve more than one area of your life. Drinking more water will help you feel more full and make your body happier, too! Find yourself a cute water bottle and get drinking. #4: Turn off unnecessary notifications. Do you really need push notifications for every single Facebook group you’re in? I know I don’t. Most of them can wait until you actually open the app… you don’t need them bombarding you constantly! I also turned off push notifications for Instagram completely since my blog Instagram has taken off. I challenge you to question the notifications that come to your phone today, and see which you really need instantly, and which can wait until you open the app on your own time. Clearing up your phone screen can help keep you more focused on the task at hand, and less worried about every other thing going on everywhere else. Choose to decide when you see your notifications, instead of letting them pester you all day long. Oh yes, I went there. I don’t mean you have delete every single email, but I encourage you to delete and unsubscribe from the junk (the 2 minutes it takes now to actually unsubscribe will save the time it’ll take to delete the next 32 junk emails), and deal with what needs to be dealt with. This task is a lot more daunting as you get older and “more adult”, but I still believe it can be done. And once you get to daily management of emails, you’ll spend less time finding what’s important, and you won’t have that big ol’ red number staring at you every day. #6: Keep a coin jar. Keep saving those little coins until you’re just dying to know how much is in there, or until you’ve found it a worthy cause. I save all my change now, and my last payout got me a new pair of shoes! Consider it your little jar of happy. #7: Say ‘thank you’ more. This is one I’ve been working on recently. We all want to feel loved and appreciated, so why not love and appreciate others?! Put out the kind of energy you want to attract. Once you’ve found your ‘little things’ and all the things you’re thankful for, take the next step and express that gratitude. Say ‘thank you’ more, and let people know when you appreciate something they’ve done. Genuinely being grateful for what you have, when you have it, is a ridiculously easy way to make your day a little happier. Also, I’m doing a short survey for a future post called “Advice from Christian College Women”. If you’re a Christian girl in college or graduated from college, I’d love for you to fill out my quick survey here. You can do as much or as little of it as you feel comfortable, but I’m trying to get at least 50 responses! That’s all for today! Which of these life hacks is your favorite? Which are you going to try? I’d love to hear from you! I really liked some of your ideas especially the little thank yous. I love these ideas! I’ve never heard of the 2-10 rule before and it seems like such a great way to prioritise and schedule your time effectively. I love this post, Kristen! Turning off unnecessary notifications is a great idea. More often than not we don’t need to immediately see all the notifications we get, and these notifications will just distract us. I agree! I think often times the notifications are more harmful than helpful. Thanks for reading! This is a great list! I’m pretty good at most of them but in the hectic of life I can lose sight of my “little things”. This is a great reminder! Thank you, I’m glad you really enjoyed this post!! I love number 2 the most!! I needed the reminder to find my “little” things. Adorable blog! Great ideas! I am a big believer in #7. Cool! I would have never thought about the coin jar. I agree with a lot of what you said. Good health practices equal a happy life. I’ve loved keeping the coin jar! It’s a great way to appreciate a little thing (spare change) to add up to a fun “treat yourself” present! It’s definitely a challenge, but so worth it when you can get into the habit! Thanks for reading! I’ve been trying to do some of these but it’s good to get a reminder. It’s a great list of things to do. I’m the same way! Even just writing this post and thinking about all these things helps me stay on track. Thanks for the tips! And I love your layout and theme, it’s a beautiful blog. Thank you so much! I just recently changed my theme, so I appreciate your sweet comments! I really love all of these! I’ve definitely found that as I set down my phone more often, I’m so much happier with where I’m at. I also love the coin jar idea! Always good to save those coins. I’m the same way, Caitlin! It’s so easy to keep picking up my phone to do things, but it doesn’t ever bring me true joy. I love saving all my coins! Thanks for reading 🙂 have an awesome day! Thanks for this list…. it’s a really good list…I am a morning person and I also have a coin jar which I will not open until it’s completely full. Thanks so much, Jackie! I’m glad you do both of those things, that’s awesome! Keeping a coin jar is so fun, I do the same thing! I think a few extra minutes in the morning is always good! (Especially compared to not missing a few minutes of sleep compared to a few more minutes to get ready.) I love that idea for the use of the coin jar, that’s awesome!! It’s definitely never easy at first, but it does get easier with time! It was especially hard for me last year, in my first year of college, but now I really appreciate getting up earlier now that I’m used to it! I love all the tips! I certainly have to turn off my notifications. Most of my apps have the notifications enabled and it drives me crazy! I totally agree with the email one too! I love when my inbox is empty. I assign all of the important emails to a folder and delete all the junk ones. It drives me crazy when I have a few busy days where I can’t check my email and my inbox gets full again! It takes a long time to catch up! I felt the same way about all my notifications!! I’ve had a few busy weeks of not hitting inbox-zero, and it makes me feel even more unorganized! I’m glad someone feels the same way. Thanks for reading! I am always up so late and it’s incredibly hard to wake up in the morning, but I love the way you explained how waking up early can basically put you in a better mood because you have given yourself the priority. Also, I might start that coin jar idea! Thanks, Dianne! Even on nights when I’m up late, I try not to sacrifice my morning time to try and break the cycle! I definitely recommend the coin jar 🙂 I’m glad you enjoyed this post!